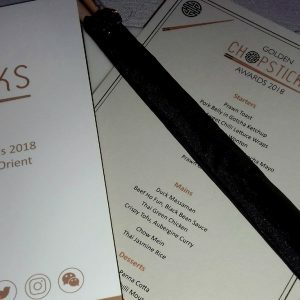 The Golden Chopsticks Awards was founded by Gok Wan, Lucy Mitchell and Sarah Lewis to celebrate the wealth of oriental cuisine in the UK and this is the first year it has been held. I was already aware of the awards ceremony and had thought it was just directed towards restaurants, so when I found out I had been nominated in the Food Blogger of the Year category, it was a big surprise. I was really overwhelmed as for the past six months due to health reasons I haven’t been able to dedicate as much time as I would have liked to new recipes and updates on here, but to find out that someone has thought my blog good enough to win an award is amazing. 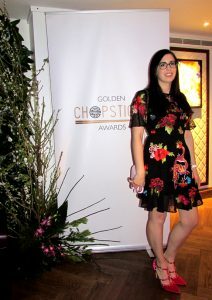 As a finalist, I was invited to the awards ceremony in London, where all the great names in oriental cooking would be present, as well as representatives from restaurants and many of the brands I cook with. I hadn’t been apprehensive about the evening until we turned up and I realise just how big it was. 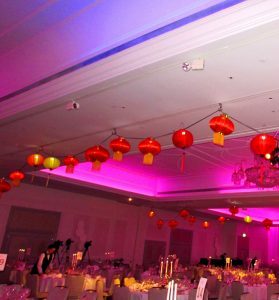 As my husband and I arrived there were hundreds of people milling around and the Marriott Grosvenor Square Hotel had a red carpet rolled out to the entrance of the ball room. Photographers took our picture as we walked in- it almost felt like being a celebrity! I kept catching sight of well known faces in the Chinese food industry- Ching He-Huang, Ken Hom and Fuchsia Dunlop to name a few, whose books I reach for a lot when I want to cook some tasty Chinese food. I’m not a really confident person and I also didn’t want to hound everyone I recognised for pictures and slightly hollow comments of how much I loved their recipes and cooking. I did speak to Fuchsia Dunlop, who was lovely despite my slightly nervous waffle. She was also one of the judges for my category. 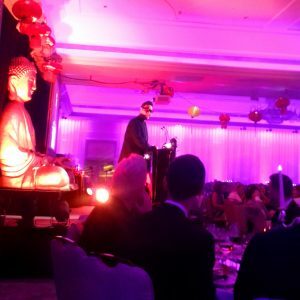 The awards ceremony room was dressed with Chinese lanterns, parasols and cherry blossoms, with a giant golden buddha on the stage and lots of pinky-purple lighting. There were lazy susans in the middle of the tables and jars of Lee Kum Kee chiu chiu chilli oil, so I was pretty sure we were about to get an oriental feast! The starters were really tasty- prawn toast made with thin slices of baguettes, pork belly, mushroom satay, tuna open wantons, tempura cauliflower (I really have to recreate that last one- yum!). The main course was more problematic- many oriental food dishes don’t lend themselves well to scaling up to feed 450 people! There were Thai curries, beef ho fun noodles, chow mein and an aubergine and tofu curry. The desserts were a trio of coconut panna cotta, chocolate and chilli mousse and lychee with mango. The food was tasty, but as a food blogger who mainly focuses on Japanese food, it would have been nice to have seen something on the menu inspired by some of my favourite Japanese flavours, or maybe to have the courses inspired by different oriental cuisines; starters inspired by Japanese flavours, main courses inspired by Chinese and desserts inspired by Thai, or something like that. 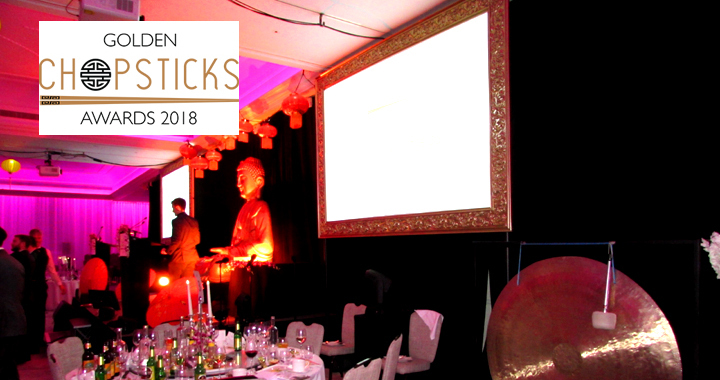 The award ceremony itself was hosted by Gok Wan and mainly focussed on awards for the best regional restaurants, as well as newcomers, best fusion restaurant and a few lifetime achievements awards. 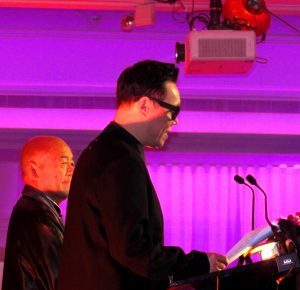 To be honest, most of them passed in a blur before Gok was announcing the finalists for my category. It was really surreal seeing ‘The Ramen Girl’ listed on a massive projection behind the stage alonside two other finalists. Unfortunately I lost out to Lizzie Hollowlegs, whose blog is packed with amazing Chinese recipes. She’s also been food blogging a lot longer than me so she’s definitely a worthy winner. My only disappointment was not getting the chance to meet her, especially as she should have been sat at our table, but unfortunately her flight was delayed and she didn’t make it in time. Maybe next year? After the awards ended, there was music and dancing. There were also goody bags being handed out, which were filled with Lee Kum Kee products, as well as tea, coconut water, panko breadcrumbs, rice wine, gin and the slightly random Charles Worthington hair mousse- what recipe should that go in? This was an amazing event to experience and be a part of. I feel really honoured to have been included as a nominee and am extremely grateful to the person who put my name forward for consideration. I originally started this blog because there seemed to be little representation of Japanese food, particularly ramen, out there. At the time, there were very few ramen bars to visit outside of London and now two years on, there seems to be much more interest in oriental cuisines, with more representation of Japanese, Korean and Vietnamese foods in restaurants and on mainstream supermarket shelves. This makes being involved in oriental cuisine so exciting and I’m in anticipation of what exciting new restaurants, brands and products will be appearing over the coming year. Posted in Reviews, Uncategorised and tagged Awards, Golden Chopsticks.